Ever since the New York Giants shifted from the 3-4 to the 4-3 defense in 1994, there have been some glimpses of outstanding linebacker play from players such as Michael Brooks, Jessie Armstead, Michael Barrow, and Antonio Pierce. But outside of Armstead, New York simply hasn’t been able to draft any long-term impact players at the position. Instead fans have been subjected to a long list busts or journeymen who have included Ben Talley, Scott Galyon, Doug Colman, Pete Monty, Ryan Phillips, O.J. Childress, Dhani Jones, Brandon Short, Quincy Monk, Wesley Mallard, Nick Greisen, Reggie Torbor, Gerris Wilkinson, Zak DeOssie (who was not drafted as a long snapper), Jonathan Goff, Bryan Kehl, Clint Sintim, Phillip Dillard, Jacquian Williams, and Greg Jones. If that list wasn’t so painful, it would be comical. 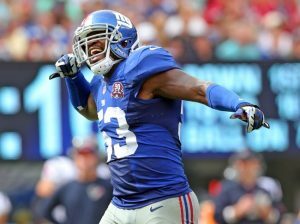 Because the Giants have drafted so poorly at this position, they have repeatedly had to address the linebacker spot in free agency, or in the case of Jon Beason, by trade. While they have had more success there, these older players haven’t remained on the team very long. Before the season, it was hoped that the linebacking position would be reasonably improved. Jon Beason was a major positive in-season addition to the team in 2013 and it was believed with a full offseason, his impact would increase even more so. The Giants added Jameel McClain in free agency and the coaching staff was talking up the improvements Jacquian Williams had made. But linebacker remained a weakness for the Giants in 2014 and was a significant factor in the team’s near dead-last rankings in overall defense and against the run. Beason broke his foot during June OTA’s and never recovered and was placed on Injured Reserve after playing in only four games. 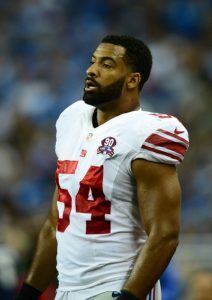 Williams, who also ended the season on IR with a concussion, simply has not developed, along with fellow 2011 rookie class members Spencer Paysinger and Mark Herzlich. All three of those players have been here four years and the Giants have very little to show for it. Jameel McClain was the best of the bunch, but he most likely looked better than he really was simply by being compared to poorer quality teammates. The only true bright spot on the horizon is Devon Kennard, a defensive end-linebacker tweener who flashed with his ability as a line-of-scrimmage player and pass rusher. However, it remains to be seen if he really can fit in as a true 4-3 linebacker who can cover tight ends and backs. “For a rookie, (Kennard is) very mature,” said Perry Fewell in December. “He’s very serious about his work and his business. He has a very professional attitude every single day in the classroom and on the field about his work and how he can improve for a rookie. We always talk about the rookie wall or what have you. It doesn’t seem to faze him. We’re giving him more in the classroom and he’s able to take it on the field. He loves to talk football and he loves to visualize what he’s doing and how he’s doing it. He takes the critiquing not personally, but he takes it as a learning experience and for a rookie, that’s very mature. Jon Beason’s 2014 NFL season was basically wiped out due to a ligament tear and fracture to the sesamoid bone in his right foot during an OTA practice on June 12. He aggravated the injury in Week 2 against Arizona, missed the next three games, and aggravated the injury again in Week 7 against Dallas. After that, the doctors decided he needed season-ending surgery and Beason was placed on Injured Reserve in October. In the end, he only played and started in four games and finished the season with 11 tackles. Beason was originally drafted in the 1st round of the 2007 NFL Draft by the Panthers. He is a three-time Pro Bowler (2008-2010). Beason missed most of the 2011 season with a ruptured left Achilles tendon. He also missed most of the 2012 season with a torn right ACL, an injury that required microfracture knee surgery. The Giants acquired Beason in a trade with the Panthers in October 2013. 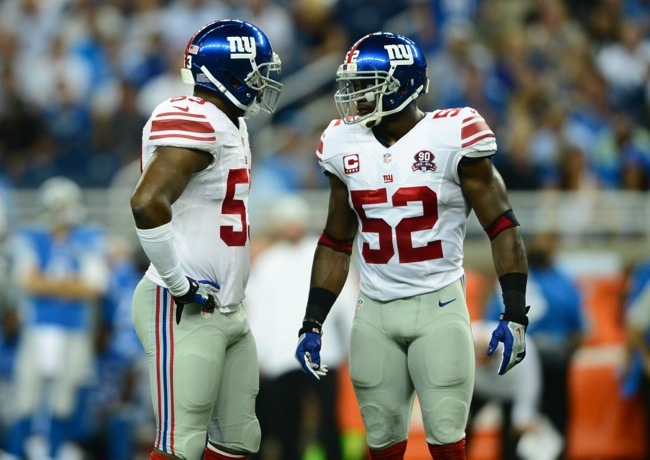 He played in 12 games with the Giants in 2013, starting his last 11 at middle linebacker. In those 12 games, he finished with 93 tackles and one interception. Beason lacks ideal size, but he is a decent athlete with very good intangibles. He is smart, instinctive, energetic, and productive, and brought leadership and gravitas to a linebacking corps in 2013 sorely needing all of those qualities. Beason is a better run defender than in coverage, where he sometimes struggles against better athletes in space. Beason is a good hitter and tackler. He obviously has been a very fragile, injury-prone player in recent years. Jameel McClain played in all 16 games in 2014 with 14 starts, primarily at middle linebacker. He finished the season as the team’s leading tackler with 116, and also had 2.5 sacks, three pass defenses, and one forced fumble. McClain was originally signed by the Baltimore Ravens as an undrafted rookie free agent after the 2008 NFL Draft. In six seasons with the Ravens, McClain started 55 regular-season games. A serious neck injury (spinal contusion) suffered late in 2012 caused him to miss the first six games of the 2013 season on the Physically-Unable-to-Perform (PUP) List. 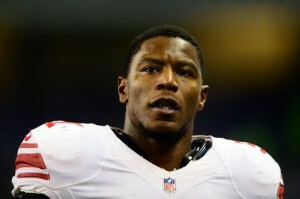 The Ravens released him in February 2014 and the Giants signed him in March. A defensive end in college, McClain has good size and he is versatile, being able to play both inside and outside linebacker. He is an aggressive, hard-working, tough, physical player who is solid against the run and a decent blitzer. McClain lacks ideal overall athleticism, quickness, and speed. He is not as strong in pass coverage. McClain is a good leader. 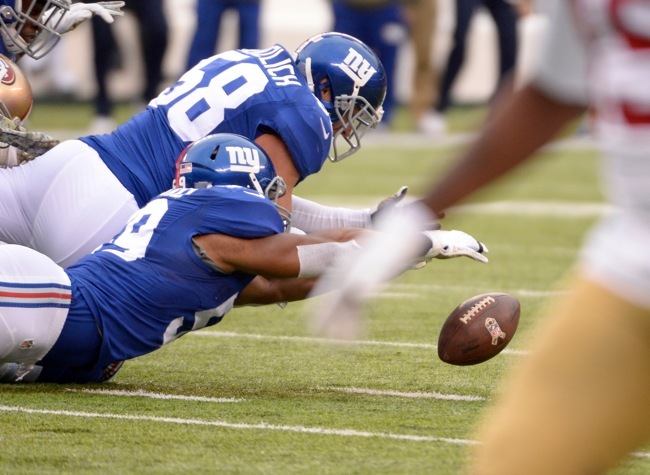 A fifth round pick in the 2014 NFL Draft, Devon Kennard was a pleasant surprise. Kennard missed three games in September with a hamstring injury and the season-finale with a toe injury, but he played in 12 games, starting six. He finished the season with 43 tackles, 4.5 sacks, one pass defense, and two forced fumbles. A bit of a ‘tweener who lacks ideal speed and quickness for linebacker, Kennard has collegiate experience playing both 4-3 defensive end and 3-4 outside linebacker. He played at outside linebacker in the 4-3 for the Giants. Kennard has good size and strength for linebacker. He is a stout player against the run and flashes as a blitzer. He is not as good in pass coverage. Kennard is a very smart player, but he has been injury prone at both the college and pro level. Jacquian Williams started the first nine game of the season, but suffered a serious concussion in early November and was placed on Injured Reserve in December 2014. He finished the season with 78 tackles and three pass defenses. Williams was drafted in the 6th round of the 2011 NFL Draft by the Giants. His 2012 season was sabotaged by a PCL knee injury that caused him to miss six games. Williams lacks size, but he is extremely athletic. He is more of a run-and-chase run defender and coverage linebacker than physical presence due to his lack of size and overall physicality. While Williams gets in on a lot of tackles, he rarely makes big plays in any phase of the game. In his fourth season with the Giants, Mark Herzlich had his most productive season, playing in 15 games with eight starts at outside linebacker. He finished the season with 52 tackles, one sack, and two pass defenses. Herzlich was signed as an undrafted rookie free agent after the 2011 NFL Draft. Herzlich was regarded as one of the better collegiate linebackers in the country before missing the 2009 season with bone cancer, which led to him having a titanium rod inserted into his left femur. Herzlich has very good size but is a sup-par athlete for the position. He is a good run defender, but struggles in coverage and is not much of a blitzer. Spencer Paysinger saw his playing time dramatically decrease in 2014. He played in 15 games with one start, but only had 15 tackles. The year before in 2013, Paysinger started 10 games and finished with 74 tackles. Paysinger was signed as an undrafted rookie free agent after the 2011 NFL Draft. Paysinger is a decent athlete who has gotten bigger and stronger. He doesn’t make many plays. Terrell Manning was placed on Injured Reserve in December 2014 with an ankle injury after playing in only one game with the Giants in Week 13. He was with the Giants in training camp before being waived on August 30. The Giants re-signed him off of the Bengals’ Practice Squad in late November 2014. Manning was originally drafted by the Green Bay Packers in the 5th round of the 2012 NFL Draft. Manning has spent time with the Packers (2012-13), Chargers (2013), Vikings (2014), Dolphins (2014), Bears (2014), and Bengals (2014). In three seasons, Manning has played in 10 NFL games with no starts. Manning lacks ideal overall athleticism and size, but he is an instinctive, aggressive, physical player who hits and tackles well. The Giants signed James Davidson to the Practice Squad in September 2014 and the 53-man roster in December 2014. Davidson was originally signed by the Cincinnati Bengals as a rookie free agent after the 2014 NFL Draft, but waived in August. Davidson was an undersized collegiate defensive end who projects to linebacker at the pro level. Whether he has the overall athleticism and instincts for the position remains to be seen. Obviously, he is a project. Uani Unga was signed to the Practice Squad in late December 2014. Unga suffered a serious injury to his right knee (ACL, MCL, and meniscus) his last year in college in 2013 and was not drafted. Unga lacks ideal size and overall athleticism but he is a smart, instinctive, physical, and competitive football player who plays the run well.